Hammack: What Is With “Farewell Tours”? In just a few weeks, the roar will be back at Daytona International Speedway. That former swampy land that was turned into a racing mecca by the France family back in 1959 will be a hub of activity once again. As we all know, Daytona Speedweeks signifies the start of another grueling 41-race NASCAR Sprint Cup Series schedule, and it is about to get underway. For most of us race fans, we have endured the darker days of winter, the NASCAR withdrawals and are now hungry for some lightening-fast speeds, the thrill of 850 horsepower singing in an eight part harmony and the smell of burning rubber permeating the air. For the second straight year, we are witnessing another of NASCAR’s “elite” drivers, Tony Stewart, hanging up the helmet on a future Hall of Fame career. Last year “Wonder Boy”, (Jeff Gordon) as Dale Earnhardt, Sr. called him, exited the sport as a race car driver, nearly winning the 2015 championship at Homestead and pulling off a “Cinderella” type ending to his racing career. For Gordon he did something that most athletes are unable to do, that is to leave their profession while still on top, still competitive, still relevant. Up until the checkered flag flew at Homestead, Jeff Gordon was still competitive and certainly still relevant for his entire 23 years in the sport. He ran up front, was a serious contender, won races, and was always in the championship hunt – even though it had been about ten years since he won his last championship. Nevertheless, by doing so, being competitive and relevant, Gordon’s “Farewell Tour” was exciting to watch. There was excitement in the air at every race track because he was capable of winning that race. As it turned out, Gordon ultimately won the Fall race at Martinsville and that win secured one of the four championship slots for him at Homestead. In the season-ending championship race at Homestead, Gordon qualified fifth, led nine laps and ended up finishing the race in sixth place. He was in the hunt, very competitive and was capable of winning his final race, which would have given him his fifth championship as he hung up his helmet. Fast-forward to 2016, for the second straight year we are witnessing another of NASCAR’s mega’s, Tony Stewart, getting set to conduct his own “Farewell Tour” for 2016. On initial inspection, I am not so sure there will be the same media and fan excitement with Stewart’s “Farewell Tour”. When announcing his retirement late in the 2015 season Stewart stated several times that he was coming back in 2016 for his last season “for the fans”. Struggling to crack the top 20 on a weekly basis the past two seasons, what could he possibly give the fans on the track? I could understand his thought process if he was in the hunt, winning races or being relevant. If that was so, then that would give the fans some reason to be overly excited about his “Farewell Tour”. Unfortunately, Stewart has only been a small shell of his once dominating aura. Since winning the championship in 2011 by winning five of the ten Chase races, Smoke has only won four races in total. Three of those wins came in 2012 and the other win came in 2013. For 2014 and 2015, Tony has accumulated two goose eggs in the win column. I might add that Stewarts’ downward spiral coincided with, or was aided, when he severely injured his right leg in a sprint car wreck race at Oscaloosa, Iowa in August 2013. Likewise, 2014 was equally unkind to Stewart, who was involved in a fatal sprint car accident that took the life of Kevin Ward, Jr.
That racing accident with Ward seemed to be another downward spiraling factor which is now heading toward civil litigation. Even though Stewart has emphatically denied it, this accident is most likely another factor that led to Smoke’s subpar performances in 2014 and 2015, as well as a factor in his ultimate retirement decision. 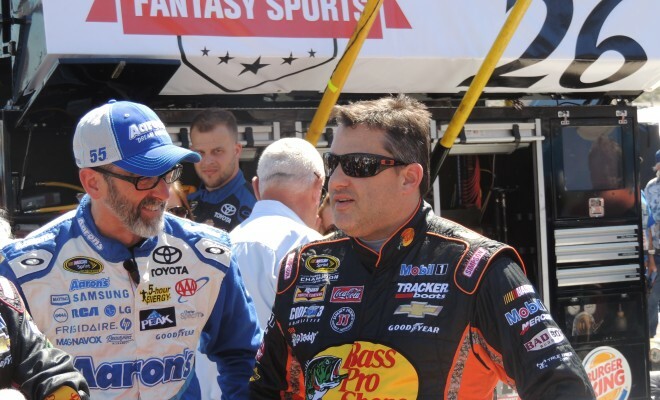 ← Previous Story Mullins: Smith In, Bowman Out; Is this a good move for Tommy Baldwin Racing? Next Story → Hammack: What Is A Burst Fracture?